OECD: Trade slowdown is "deeply concerning"
Will China trigger the next recession? 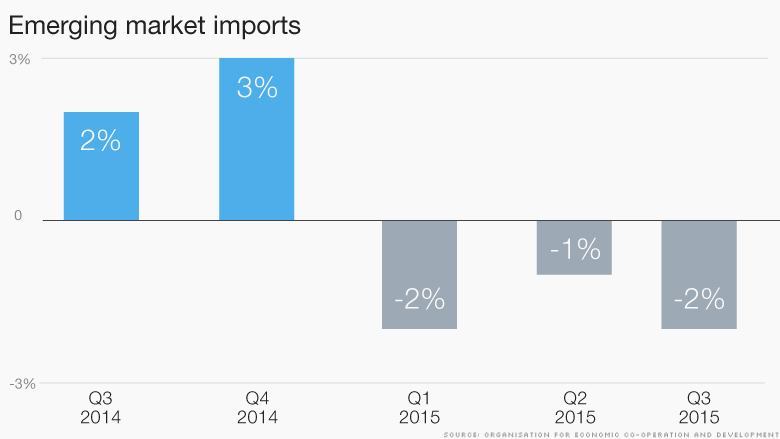 Global trade growth is slowing sharply in 2015 and China's weaker economy is one big reason. "Growth rates of global trade observed so far in 2015, have, in the past, been associated with global recession," the Organization for Economic Co-operation and Development said Monday. World trade is expected to grow by just 2% this year. The average rate of growth for 2003-2012 was 5.6%. Imports into emerging markets are falling sharply, with China accounting for nearly one third of the drop, the OECD said in its outlook for the global economy. "This is deeply concerning. Robust trade and global growth go hand in hand," it said. The OECD cited weaker world trade as it shaved its forecast for global GDP growth this year to 2.9% from a previous forecast of 3%. Sluggish world trade growth in the past few years was down to a weaker appetite for imports in the United States and Europe. Now, it's emerging markets that are facing weaker demand for their commodities. The OECD states that recent steps announced by China such as lower bank lending rates and planned infrastructure investments could put a floor under commodity prices, and hence help produce a small uptick in world trade next year.